How to pay the entrance to Machu Picchu with MasterCard? Do you have problems to buy the entrance to Machu Picchu with a MasterCard? Surely the official ticketing website does not accept this type of card. The website of the Ministry of Culture of Peru does not allow buying tickets with MasterCard. However, it is still possible to get the ticket with this card. How to pay the entrance to Machu Picchu with MasterCard? Learn how to get the ticket with this payment method. 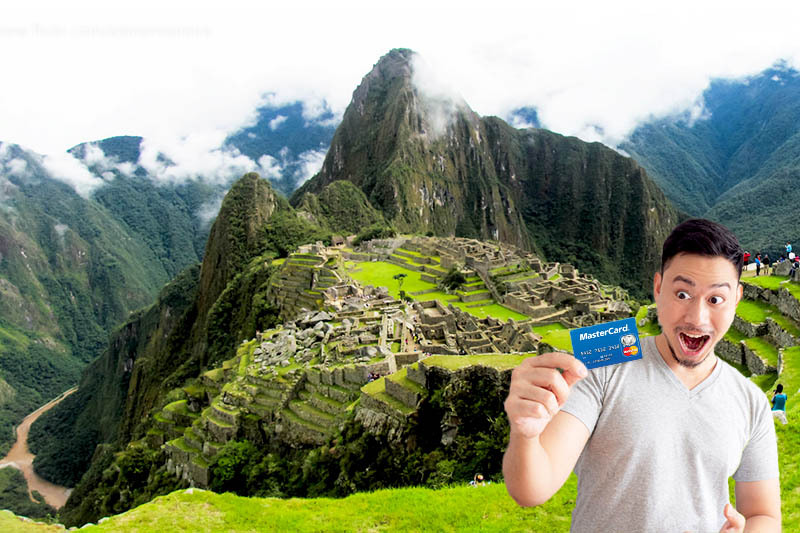 How to buy the entrance to Machu Picchu with MasterCard? Can I pay the entrance to Machu Picchu in Cusco with a MasterCard? And how to buy the entrance Machu Picchu online with MasterCard? How to pay for the entrance with MasterCard on this website? Problems to pay the ticket Machu Picchu with MasterCard? What place on the internet is safe to buy the ticket Machu Picchu? Buy the entrance Machu Picchu in Cusco or online? Is it necessary to have a MasterCard ‘SecureCode’ card to buy the entrance to Machu Picchu? Is extra commission charged for paying the ticket Machu Picchu with MasterCard? Do the main services of Cusco and Machu Picchu accept MasterCard? Is it safe to pay with MasterCard online? Why buy the ticket at ticketmachupicchu.com? In an authorized office in the city of Cusco. Online through an authorized agency or on the official website of the Ministry of Culture of Peru. Through this web page (Ticket Machu Picchu). All these methods accept MasterCard as a method of payment, except for the official website of the Ministry of Culture of Peru. This web platform only accepts ‘Verified by Visa’ cards as an online payment method. Can I pay the ticket Machu Picchu in Cusco with a MasterCard? The authorized offices for the sale of tickets Machu Picchu in Cusco accept Visa or MasterCard credit or debit cards. To do this, the visitor must show their passport or identity document at the time of making their purchase in person. In the Casa Garcilaso: Garcilaso Street s / n Cusco – Peru. Dirección Desconcertada de Cultura Cusco: Calle Maruri 324, Cusco. In Aguas Calientes: Avenue Pachacutec s / n.
On the internet you can buy the ticket Machu Picchu through the website of an authorized agency or on the official website of the Ministry of Culture of Peru. This last website does not accept MasterCard as a method of payment, so the only way is to do it through the website of an authorized tourism agency. On the internet, there are several tourist agencies that offer tickets Machu Picchu in exchange for an extra commission for their services. However, for those people who have a MasterCard, this is the only way to get the entry ticket. Ticket Machu Picchu is a tourism agency that offers ticket sales online quickly and safely. On this website you can pay with any type of MasterCard. Check the availability of the Machu Picchu entrance type of your choice on the date and time you wish to visit. If you find availability, complete the booking form with your personal information. Send an email with a copy or digital photograph of your passport, identity document or university card. Make the payment with your MasterCard card. Generally the payment is made with PayPal. Receive the tickets in the inbox of your email and print them to present them the day of your visit to Machu Picchu. Buying the entrance Machu Picchu online is the best way to ensure entry to the Wonder of the World because it can be done from anywhere in the world. In Ticket Machu Picchu can pay the entry by any type of MasterCard. Click on ‘Reserve now’ and check if there is availability in the type of entry and the date of your preference. If you found availability, complete the reservation form with your names, email, country, type and document number. Accept the terms and conditions and choose ‘MasterCard’ as payment method (you can also choose Visa, Diners Club or PayPal). Make the payment with ‘MasterCard’. Immediately afterwards you will receive a receipt for the payment issued in your email. In less than 24 hours (48 hours on weekends) you will receive the entrance to Machu Picchu in your email. You should only print it. Problems to pay the entry Machu Picchu with MasterCard? The official website of the Ministry of Culture of Peru does not accept MasterCard as payment methods. This problem is the most recurrent when buying the entrance Machu Picchu through the official website. However, it is also possible to make the payment directly through this card. Most tourist agencies only accept MasterCard payment through PayPal. Most tourist agencies authorized to sell the ticket Machu Picchu online accept payment by MasterCard through PayPal. This payment method is preferred for its speed, security and ease. I can not buy the Machu Picchu entrance with MasterCard for someone else. Through the web page of an authorized agency it is possible to buy the ticket for another person. The offices of the Ministry of Culture in the city of Cusco only accept payment with MasterCard with the identity document or original passport of each person who wants a ticket. Some tourist agencies request a MasterCard ‘SecureCode’ card for the purchase of the ticket Machu Picchu. The MasterCard ‘SecureCode’ card is a security system for online purchases. Some tourist agencies only ask for this type of cards for the purchase of the ticket Machu Picchu. On this website you can buy your tickets to Machu Picchu with a MasterCard credit or debit card. You can do it directly, easily and safely. Visa Card – The official website of the Ministry of Culture of Peru only accepts ‘Verified by Visa’ cards for the online purchase of the ticket Machu Picchu. Most tourist agencies accept this card as a method of payment. Diners Club Card – Only some authorized travel agencies accept this type of card for the payment of the Machu Picchu ticket. PayPal – Most tourist agencies accept this method of payment. PayPal accepts Visa, MasterCard and American Express cards. What place on the internet is safe for the purchase of the Machu Picchu ticket? The tourism agency has an authorization code issued by the Ministry of Culture of Peru. The website has an Internet security system, which guarantees the privacy of the information provided by the tourist. The tourism agency has its own premises in the city of Cusco as well as several means of communication: telephone, email, etc. People who visited Machu Picchu through this agency have good comments in the travel forums as TripAdvisor. In Ticket Machu Picchu can pay your entrance Machu Picchu safely. This website is authorized by the Ministry of Culture of Peru and has security systems online. Buy the ticket Machu Picchu in Cusco or online? The most advisable thing is to buy the ticket Machu Picchu online. Thus, the visitor can ensure entry to the Wonder of the World. Otherwise, it may happen that the tourist does not find availability once in Cusco. Most tourist agencies only require the normal MasterCard for the purchase of the ticket Machu Picchu online. Both the Peruvian Ministry of Culture in Cusco and the online tourism agency charge an extra commission when buying the ticket Machu Picchu with MasterCard. The main services of Cusco and Machu Picchu accept MasterCard as a method of payment. However, because these services charge an extra fee for card purchases, it is preferable to have cash. Is it safe to pay with a Master Card online? The purchase of the ticket Machu Picchu online with a MasterCard card must be made on a secure website belonging to an authorized tourism agency and with the best recommendations by users. On this website you can pay for your ticket easily and safely. Here you can pay your discount ticket for university students, minors and the Andean Community (Colombia, Bolivia, Ecuador and Peru). Remember that we are the number 1 website to sell tickets to the Wonder of the World. ← How to buy the entrance Machu Picchu 2019 in advance?